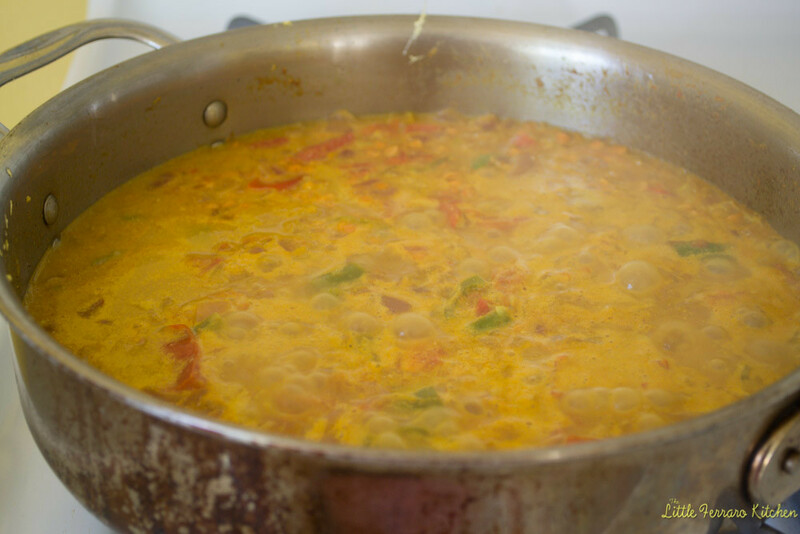 According to my research, dhal is a lentil soup made with ghee (which is clarified butter). But I have seen other posts and recipes where it is more of a thick lentil stew and the recipe creator still titles it “dhal”. Wanting to be culturally correct and not step on any dhal toes, I thought a curry would suit this better. It has several spices, such as turmeric and curry powder and is thickened with coconut milk to help balance the heat. 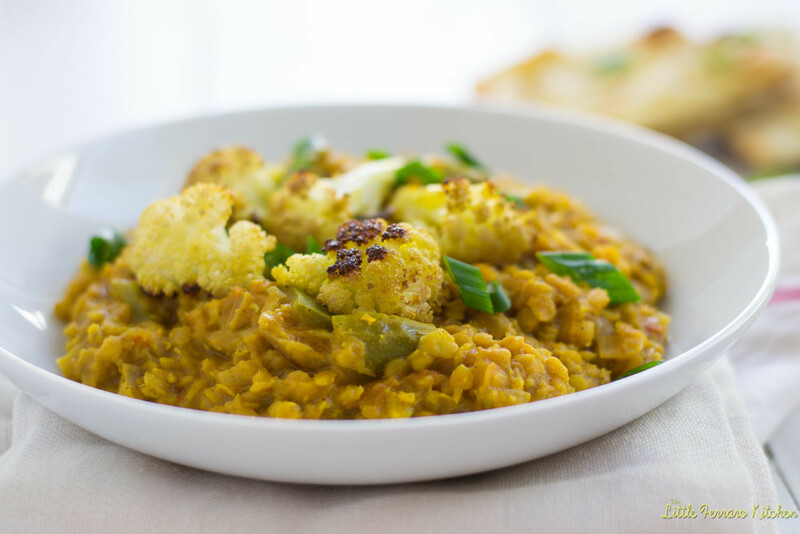 I also topped the lentil curry with spicy roasted cauliflower, which I am currently obsessed with, giving it fabulous abundance and texture. This is such a glorious and really easy to put together vegan dinner and even my meat-eating husband scarfed it down. Its thick and hearty and we served it with naan bread and spicy mango chutney. If you are not vegan, I suggest adding a scoop of thick Greek yogurt to counter the spicy flavors of the chutney and curry. I loved the flavors of this curry so much that I am actually making another curry tonight with lemongrass and chicken. The combination of spicy curry and cool coconut milk is just so remarkable, I can’t think of anything that wouldn’t pair perfectly with those flavors. 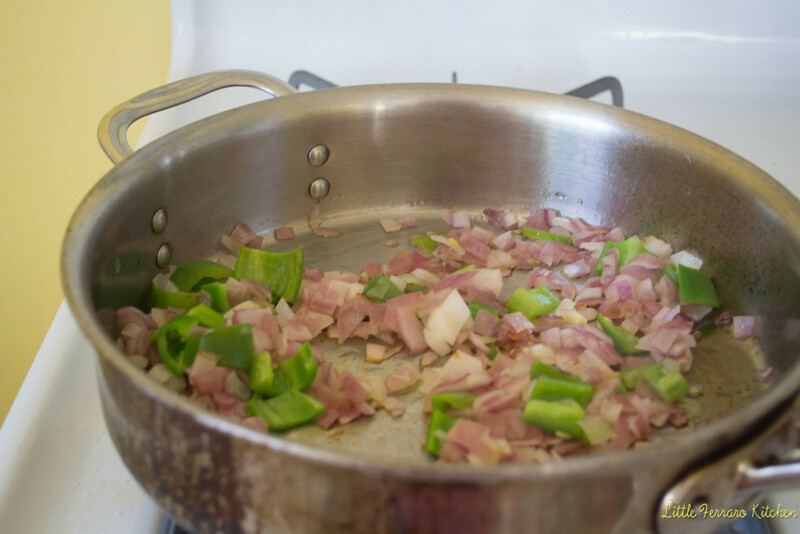 1) In a large skillet, saute jalapeno and onion in olive oil until they begin to break down and soften. About 3-4 minutes. 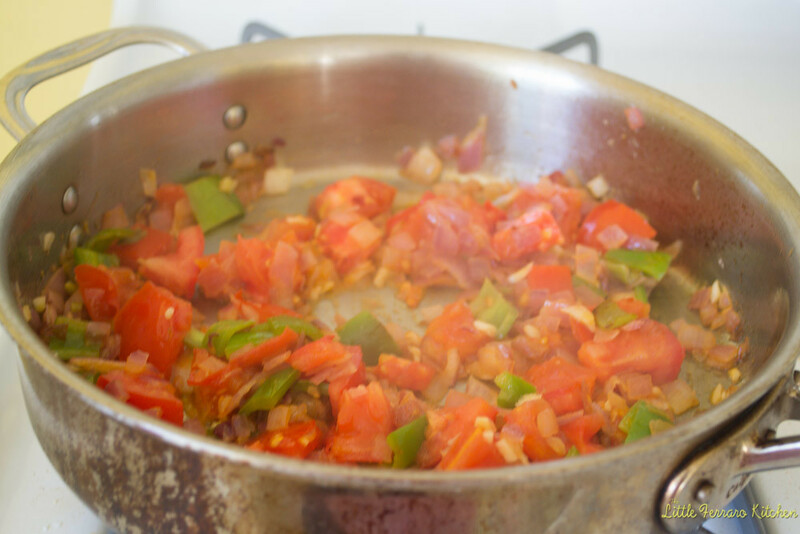 2) Add chopped tomatoes and garlic and continue to saute so the tomatoes begin to soften and garlic lightly caramelizes. 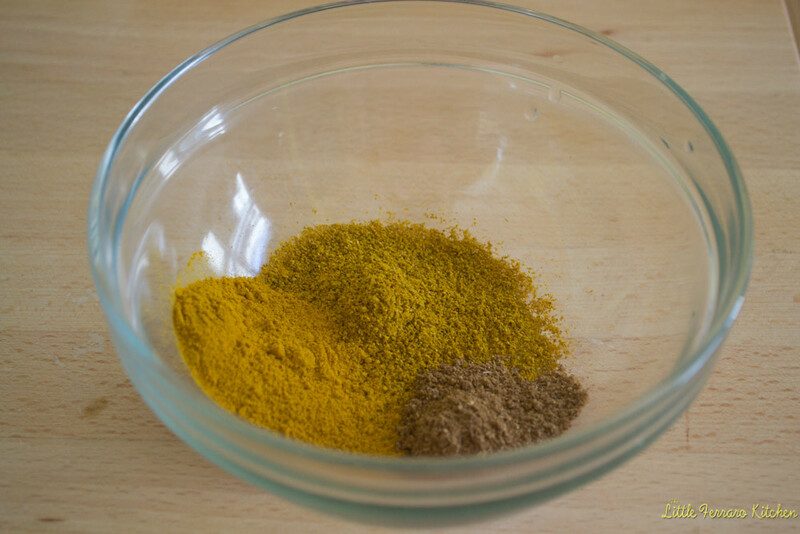 3) Add the spices, turmeric, garam masala and curry and grate in 1/2 in fresh ginger root. Saute for another minute to cook the spices. 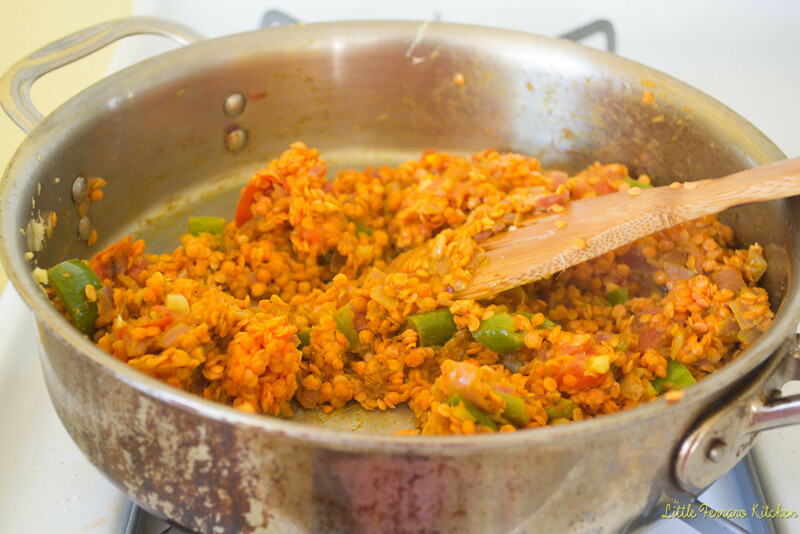 4) Add 1 cup red lentils and quickly stir everything to combine. 5) Then add 2 1/2 vegetable stock and 1/2 cup coconut milk. Stir everything together and allow to cool on low-medium for about 2o minutes. You want to have a gentle simmer. 6)When done, lentils should be soft, thick and liquid absorbed. At this point salt the lentils and taste for seasoning. *Tip- You want to salt the lentils after they are cooked, otherwise you risk toughening them up. 7) To make the cauliflower, cut into florets and place on baking sheet. Toss with olive oil, turmeric, curry and salt and pepper. Roast at 400 degrees F for about 30 minutes or until the cauliflower softens and caramelizes. 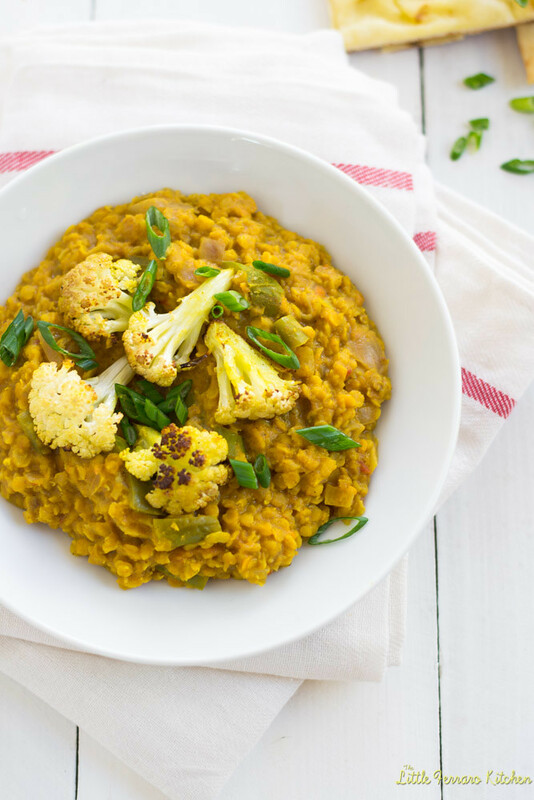 8) To assemble, serve curry lentils with rice (optional) and top with cauliflower and chopped green onions. In a large skillet, saute jalapeno and onion in olive oil until they begin to break down and soften. About 3-4 minutes. 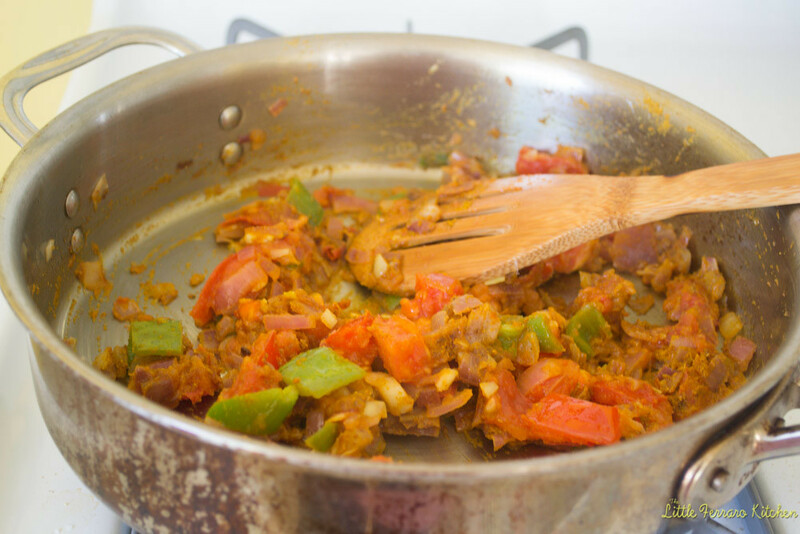 Add chopped tomatoes and garlic and continue to saute so the tomatoes begin to soften and garlic lightly caramelizes. Add the spices, turmeric, garam masala and curry and grate in 1/2 in fresh ginger root. Saute for another minute to cook the spices. 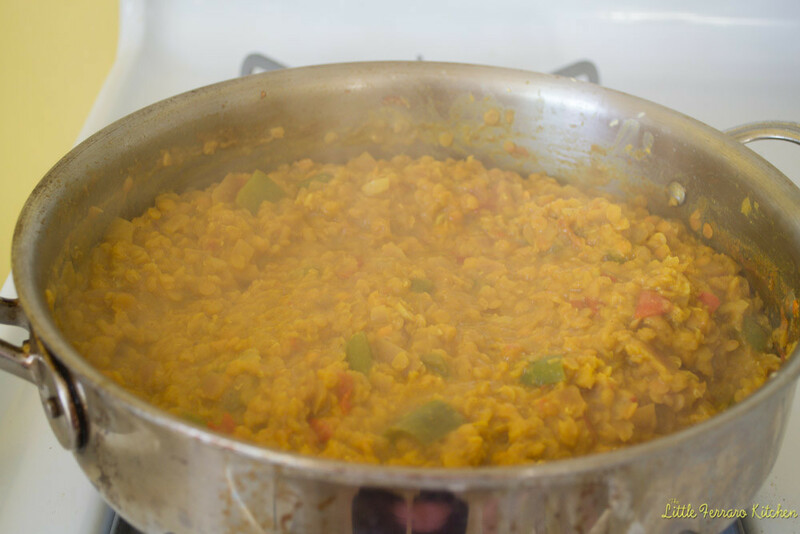 Add 1 cup red lentils and quickly stir everything to combine. Then add 2 1/2 vegetable stock and 1/2 cup coconut milk. Stir everything together and allow to cool on low-medium for about 2o minutes. You want to have a gentle simmer. When done, lentils should be soft, thick and liquid absorbed. At this point salt the lentils and taste for seasoning. *Tip- You want to salt the lentils after they are cooked, otherwise you risk toughening them up. To make the cauliflower, cut into florets and place on baking sheet. Toss with olive oil, turmeric, curry and salt and pepper. Roast at 400 degrees F for about 30 minutes or until the cauliflower softens and caramelizes. 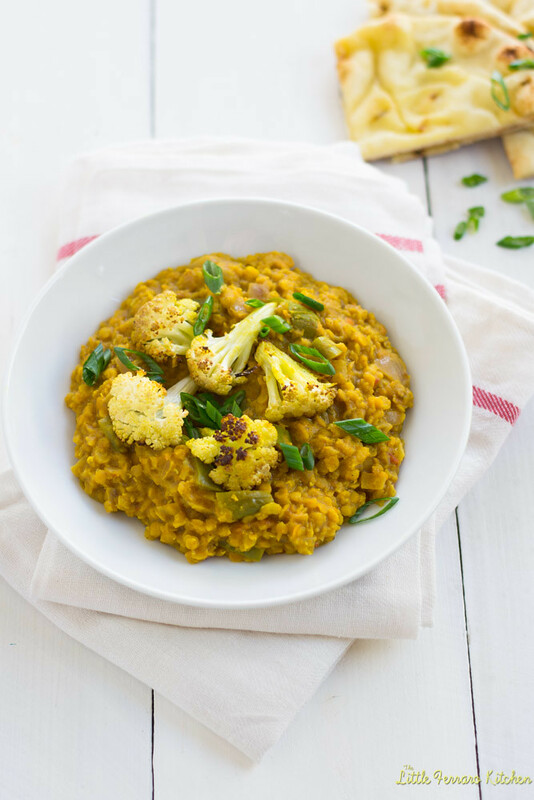 To assemble, serve curry lentils with rice (optional) and top with cauliflower and chopped green onions. This looks really good, and I just picked up some cauliflower from the farmers market on Wednesday. Now I know what to fix. This looks amazing! Oh awesome! There’s nothing better than roasted cauliflower!! Ha, I often have these naming conundrums. I love both Dahl and curry, so I’m sure whatever this is, it’s great. It looks fantastic! This is definitely my kind of lunch. Filling, delicious and loaded with protein! Hi Angie!! Thank you so much! Aren’t lentils so awesome?!! What a wonderful blog; so glad to have you through SS! Next to Italian, I love anything made with curry! I can just smell the incredible aroma of this cauliflower with curry! Pinning, plussing, and now following. Hope to be able to jump into SS soon; I visited my grandson this week so I couldn’t post in time. Thanks for this great recipe! Thank you so much Roz! Thank you so much Pat! You just made my day! Zoe, thank you so much for introducing me to your blog! I love, love learning about other cultures and Indian food is one I am minimally educated in but want to learn more! I will certainly be reading your blog to learn more! And thank you for your wonderful comment 🙂 More dal to come! This is not the original recipe you put on the web – where are the yellow split peas? Very annoying to save a favourite recipe and when you return to it via a bookmark it has been changed. Please speak to your IT people – very disappointing and completely avoidable. Hi Lynn. The recipe has not changed at all since the original posting date. And there are no yellow split peas, the title and recipe both say “red lentils”. perhaps you saved a different recipe? Just made this and it is so so delicious! Perfectly balanced. Thanks! I made this dish last weekend and just had the last of the leftovers. It was so good from day 1 to day 3. All the flavors I love and easy to make! P.S. Hope to meet you in Bellingham, WA! Hi Rosemary!!! YAY so happy you liked it!! We just got settled in Bellingham and LOVE it..can’t wait to explore a bit!! 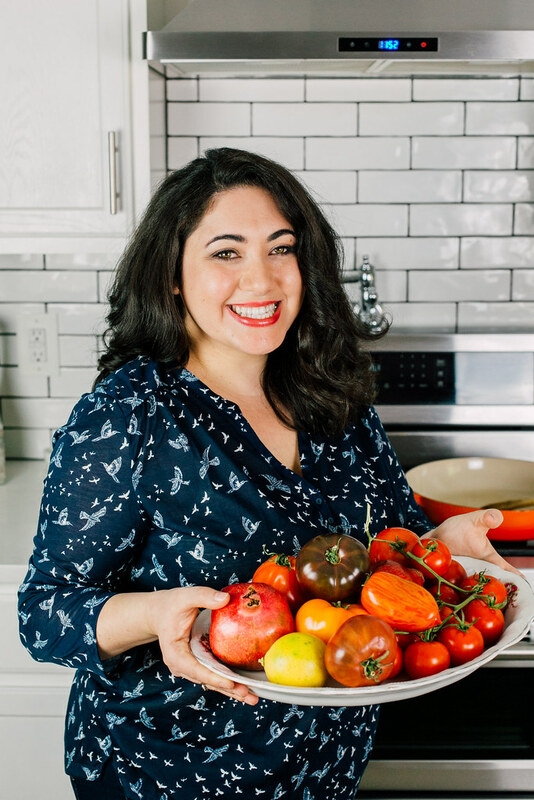 Would love to meet some locals and get the local “foodie” info too! Delicious, thank you! I added some green pepper with the tomatoes. Also some cumin seeds roasted with the cauliflower. Worked well I think!